WPmudev uses deliberate speed bait to sell theme memberships. – Get under 2-second load times on shared magnetic hosting with free plugins and themes. WPmudev uses deliberate speed bait to sell theme memberships. Be forewarned, the blog post we review here is deliberate bait to sell wpmudev theme memberships. It’s the flawed article: 15 Great Mobile First WordPress Themes to Boost Your Site Performance by Rachel McCollin. First published in 2016 but still relevant to what we teach about speed. We found one potential winner in the bunch. The first theme presented is one of wpmudev’s themes called “Upfront.” But you must be a paid member to download it. We don’t use paid themes. So it’s instantly off our evaluation list. All other themes on the reviewed blog page are free and available from the free WordPress Theme Directory. We’re searching for web-speed treasure. The article claims to focus only on theme’s with excellent site performance. As you will see, many of the WordPress themes recommended don’t match our selection methods or guidelines. Page load time (speed) is especially critical for small-screen mobile websites. That’s because mobile must connect using slower, wireless bandwidths. Today, mobile websites are built using responsive WordPress themes. Responsive means the page content resizes to fit any screen – whether it be on a smartphone, tablet, or desktop. Old websites just for desktop viewing were built with fixed-width pages. That method no longer is in vogue. We’ve found theme download file size is a big indicator of speed potential. A theme download file below 1M is most apt to create web pages loading in under 2 seconds. This delay is the longest site viewers are willing to wait without feeling frustrated, impatient, or bored. Load time affects the user experience (UX). Let’s make a quick check of the suggested theme list. Of the 15 recommended themes, only 7 might be fast. Only one speed theme is of particular interest – and we find it a great discovery. Who knows? Perhaps, the treasure we seek. 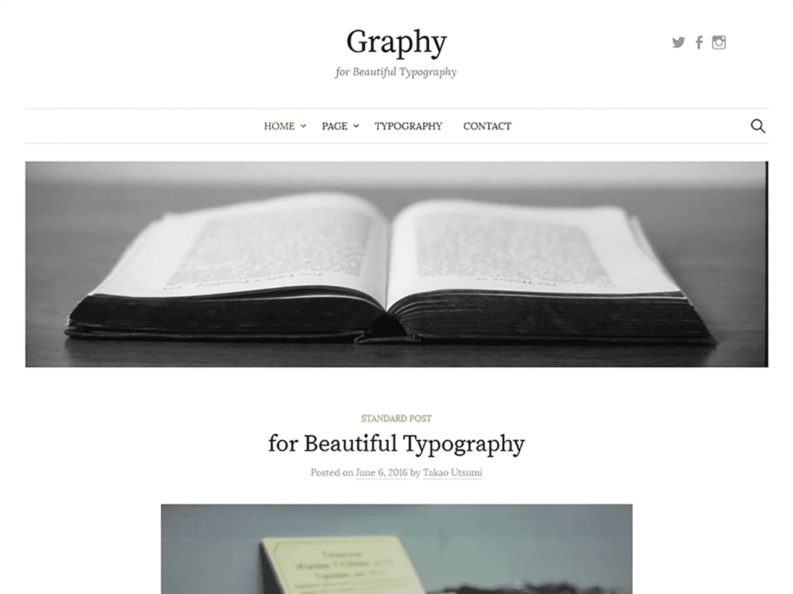 At 356k download, the Graphy theme has by far the greatest potential for a fast-loading WordPress theme. As an extra bonus, Graphy has nice, readable typography. Custom, non-browser-default fonts usually are not a speed asset. Only further testing will tell. The text font stack is: Lora, Georgia, serif. And the header font stack is: Bitter, Georgia, serif. Bitter is a slab serif font. These must be called from Google’s cloud font library. Font calls create delays. We find that Graphy including Lora and Bitter fonts adds about 700 milliseconds to the load time. That is almost one-third of our performance budget. If we add images, it may be necessary to switch off the fonts with Remove Google Fonts References plugin. The download file decompresses to 581.1k. This is quite small. We find that 161.4k of the file is a screengrab. This will not affect load time. Neither will the 142.3k of languages translation files. But we do see one speed offender we don’t like: Genericons. We consider theme use of Genericons dead weight. Genericons is 174.2k of the theme file size. How much drag is added depends upon how Genericons are used. Some themes activate Genericons HTTP requests (calls) even when the icon font isn’t even on any page. So further testing will reveal the cost of the theme author’s choice. We do notice that Graphy uses an image icon instead of a Genericon for it’s ubiquitous, top-right search field – a magnifying glass icon. This is a good sign. It means it doesn’t call the heavier Genericon equivalent. Genericons may not be activated at all if not used by the site owner. Sadly, Genericons in Graphy theme add about 35k to 45k page weight. No icons are shown on the page. That means we could deactivate it without any repercussions. Graphy includes some nice customization features. Graphy theme has an optional widgeted sidebar and 4 footer widgets. If the sidebar widget isn’t used the theme is single-column, full-width. The footer width (columns) is automatically adjusted depending on how many footer widgets are used. If you do not use any, none will be displayed. The theme has a few other extras not usually included in stripped-down, fast themes. You can upload an image logo. This logo can replace the site title and you can add border radius for spacing. You can also specify the link color and a second hover color. Additionally, you can choose to display summary text – or alternatively, full text for posts. You can also hide or show the author or category. These selections are made with check boxes. You can add a single custom header image. Only one custom menu is available. That limit is only a minor negative. Don’t trust WPmudev theme recommendations for speed. Previous PostPrevious Reduce SSL speed overhead for Easy Digital Downloads plugin and PayPal transactions. Next PostNext Google’s hypocritical policies affecting mobile speed.